Stenographer Gr III vacancies on Adhoc basis. There are total 11 vacancies available in this Rupnagar District Court Recruitment 2017. Candidate should require basic qualifications are B.A/ B.Sc/ equivalent from recognized University and Matric pass with Punjabi as one of the subject. For Clerk Jobs candidate must pass Computer Proficiency Test with the speed of 30 WPM. For Stenographer Test candidate must have to qualify English shorthand test with the speed of 80 WPM and 20 WPM in transcription. Age of the candidate should be between 18 years to 37 years for both posts. Interested candidates have to send the application forms on a plain paper with complete Bio-data to the Office by 15-11-2017. Candidate selection for Clerk and Stenographer Jobs is based on written test, Computer Proficiency Test and Interview. 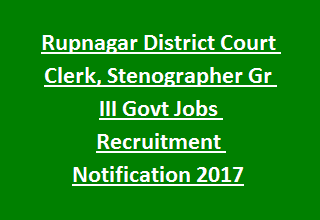 More updates regarding Rupnagar District Court Recruitment Clerk, Stenographer Jobs application submission procedure, Important Dates, Age limits, Qualifications, Selection Method are given below. Total available vacancies in District Court Rupnagar Recruitment are 11 posts. Clerk: B.A/ B.Sc/ equivalent from recognized University and Matric pass with Punjabi as one of the subject. Candidate must have to pass Computer Proficiency Test with the speed of 30 WPM. Stenographer: B.A/ B.Sc/ equivalent from recognized University and Matric pass with Punjabi as one of the subject. Candidate must have to qualify English shorthand test with the speed of 80 WPM and transcription at a speed of 20 WPM. Must have proficiency in Computer. Age of the candidate must be below 37 years and above 18 years as on 01-11-2017. Relaxations in age admissible as per rules. District Court Rupnagar Recruitment selection for Clerk, Stenographer vacancies is based on written test, Computer Proficiency test/ Interview. For clerk Post Candidates have to attend for written test which will be held on 02-12-2017 at 10.00 AM. Qualified candidates in written test (qualifying marks: 40%) have to appear for Computer Proficiency Test, which will be held on 09-12-2017. Stenographer Test will be held on 18-11-2017 at 10.00 AM. Please visit the Rupnagar Dist recruitment page http://ecourts.gov.in/Rupnagar/history for more updates. Candidates fulfilling all eligibility criteria have to submit application on a plain paper with complete Bio Data. Along with the application applicant need to send 3 passport sized photographs, Xerox copies of attested documents to the Office of District & Sessions Judge, Rupnagar before 15-11-2017.